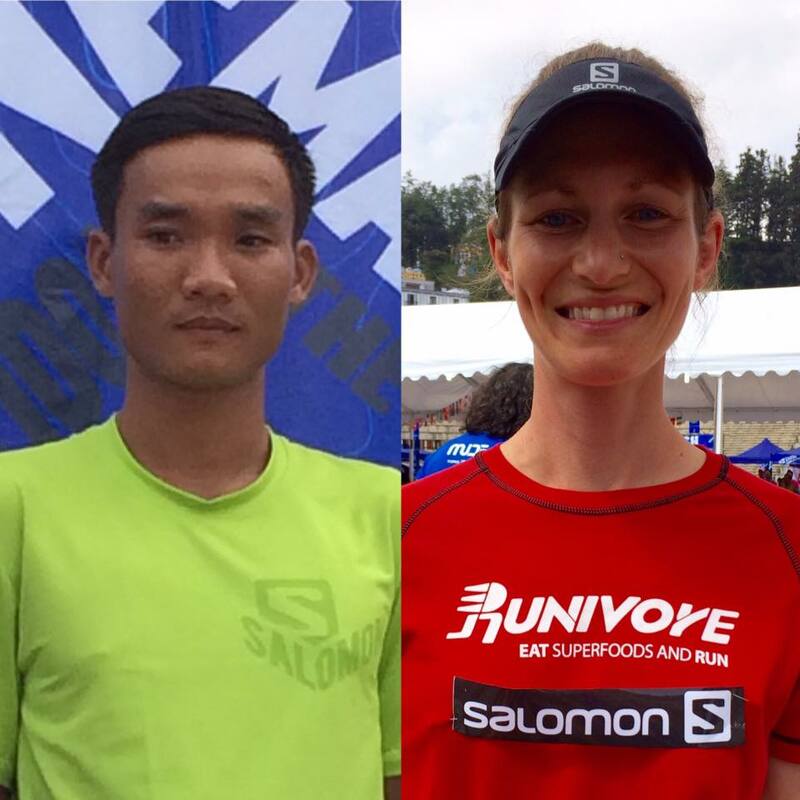 The Vietnam Mountain Marathon in Sapa saw quite an upset on the main 100K race as local runner Quang Tran had the better of current Asia Trail Master champion Manolito Divina. In the women's, Kim Matthews delivered on her role as favourite to take her third ATM race victory of the season. After finishing second in the Vietnam Jungle Marathon last May, Quang Tran had only one focus in the last months and that was to prepare himself for the Sapa race. While everyone was pointing to Cao Ngoc Ha as Vietnam's best bet to compete against the pinoy tandem of Divina and Arnold Lozano, Quang Tran was at the front early on. Manolito Divina was able to resist for a long time, but eventually had to admit the Vietnamese runner was simply too fast last weekend. In the end, the gap at the finish had even built up to 1 hour and 15 minutes, which is impressive. Finish time: 13 hours and 17 minutes. Cao Ngoc Ha completed the podium in third place another full hour back. It illustrates the dominance displayed by Quang Tran. SIngapore's Chua Ying Zhi came very close to the podium in fourth place only a few minutes behind Cao Ngoc Ha. Arnold Lozano - winner of this year's Cordillera Mountain Ultra - came home in fifth place. While Quang Tran collects 500 ATM championship points and now totals 950 in two races, Manolito Divina moves up into the ranking's top 10 with this third points score of the season. Cao Ngoc Ha improves to 4th place, equalling the total score of Isaac Yuen Wan Ho, who will be in action next at the Mesastila Peaks Challenge. Steven Ong still heads the championship ranking. Kim Matthews was not really under pressure last weekend and ran a solid 17 hours 52 to claim the victory. The Australian, who recently moved to Ho Chi Minh City, is becoming a real challenger now for the Asia Trail Master women's title. Her VMM victory propels her to second place in the ranking with four races, just five points behind Ruth Theresia but also 20 ahead of Tahira Najmunisaa! Lily Suryani continues to lead the championship ranking with five results in the bank. In fact, after completing the tough Bandung Ultra 100 last week, the Indonesian finished sixth on the 100K of VMM as well! However, her points total does not increase further as VMM was her sixth race and only the best five results count. Lily needs to do better than 4th place in a regular trail race, as that was her placing in both Tahura Trail and Merapoh Trail. On the podium beside Matthews was Hoa Banh, running with Australian nationality as well, and Nguyen Thi Duong from Vietnam, who will move up to the top 20 of the championship ranking with her third result of the season. There was also a 70K in Sapa, and that race was won by Britain's Graham Knight ahead of Hanoi's Quang Nguyen after a good battle. In the women's France's Nadia Koucha took a strong victory ahead of Malaysia's Penang Eco 100 winner Christine Loh. After a short break, this weekend the 2017 Asia Trail Master Championship series enters the second quarter with two points races in Peninsular Malaysia and in Central China (UT Xinxian 100 in Henan Province). The Sungai Menyala Forest Trail arguably attracts most attention giving its stellar line-up including both current Asia Trail Master champions. Manolito Divina (PHI) and Tahira Najmunisaa (MAS) will not have an easy walk in the forest on Sunday as the competition on paper is tough. 2015 ATM champion and new Grandmaster Arief Wismoyono is traveling to Port Dickson for the 50K race, and appears set to regain the lead from Gaspard Dessy in the current ATM points standings. Tahira will be facing the talented Sandi Menchi from Baguio in the Philippines, recent winner of the Cordillera Mountain UItra. The Sungai Menyala Forest Trail is pure trail running, but with little elevation gain on the 50k course it is a race suited for fast legs. Race director Razif Yahya, himself a very experienced international trail runner and technical organiser, sees a bright future for his latest event, which caters for runners of all levels. It will be the third ATM race for both Manolito Divina and Arief Wismoyono this season. Both scored race wins: Manolito in the Rizal Mountain Run and Arief in Coast To Coast Night Trail Ultra. While the Filipino ace had an unfortunate DNF at Tahura Trail in the season's opener, the Bandung Explorer leader also scored a fourth place there. On Sunday he needs 350 points - equivalent to a 6th place - to overtake Gaspard Dessy in the ATM championship ranking. Strictly in theory, there is a third participant in the Sungai Menyala Forest Trail who can claim the top ranking spot: Malaysia's Yim Heng Fatt went very well in Thailand and Brunei and is 455 points behind Dessy at the moment in third place. That implies he needs a win and a DNF of Wismoyono, though. Another Malaysian to watch out for is Steven Soonseng Ong - joint winner of the UT Unseen Koh Chang SuperTrail in Thailand last February and currently 9th in the ranking. In Thailand, Ong ran a tactically very clever race to come out on top. Can he do it also on a shorter and less technical course? Tahira Najmunisaa is already lining up for her fourth ATM points race of the year. Unbeaten in 8 ATM races, she is the record holder as well in terms of ATM race wins. Particularly in Tahura Trail and UTKC, the Malaysian running icon was again blisteringly fresh and quick. Still young herself, she will be determined to extend her string of race victories even more against upcoming young talent Sandi Menchi. The Filipino actually beat Tahira on a climbing course in Sabah last year, but Sungai Menyala is different. Other top female runners at the start will be Gretchen Felipe, the Lintanga sisters, Cheryl Bihag and Jeri Chua. As usual, you can follow the action live via our social media channels all weekend. The race itself starts at 7:30 a.m. on Sunday morning. ..or will runners such as Steven Oong upset the established champions?